Anyhow, I first need to say that I can't tell my tale today without mentioning the new girlfriend, Michelle, who is simply amazing, charming, intelligent, and gorgeous. But, besides that, she's also an event coordinator by trade. Yeah. I know. What better person could a foodie be dating, huh? Some of the side benefits started to emerge earlier this week. Michelle let me know that Sullivans was trying to woo her into sending some business their way and wanted to treat her and someone to a free lunch so that they could show off a little bit. Well, I was all over the idea for being "and someone" and readily cleared my calendar for the outing. Well, unfortunately, after some missed calls and scheduling conflicts, we had to reschedule the free chance for a restaurant to impress us to another day. Fortunately, right down the street from Sullivans was someplace that I've been wanting to check out. I've heard about Frank through the grapvine and have been checking out the menu on line in eager anticipation. I feel the need right now to admit that I am midly addicted to several reality TV shows, with most of my excitement being around food related shows like Hell's Kitchens, Kithen Nightmares, and The Next Food Network star to name a few. I think the challenges on those shows that I like the most are when the contestants are told to take a common everyday and put a new gourmet twist on it. I think it hits home with me since I'm always trying to reinvent any dish I make at home. Nevertheless, when I saw the menu at Frank, I was excited because of a chance to see the classic American hot dog reinvented. It didn't take much to convince Michelle and we were off for the alternate lunch plans. Frank is on Colorado, near 4th Street downtown in the old Starlight. Walking in, I was pleased already. The environment and the decor seemed pretty minimalistic and just cried "Austin" to me. The restaurant, as of today, hasn't been open for even three weeks yet, but it was pretty much packed. In fact, even on the very late end of the lunch hour (pushing up against 1:00), we were seated at the very last open table in the place. I liked the menu. It was quite simple and to the point. There was no doubt what Frank's niche was. I drooled seeing some of the options on the menu. Save for a few options, it appears as if Frank's strategy for reinventing the hot dog stemmed from replacing the components of your traditional sausage on a bun with higher end ingredients as well as offering little twists like coating any hot dog on the menu with a cornbread coating before putting it on a bun. There was one option on the menu, though, that caught our eyes and we immediately had to try. 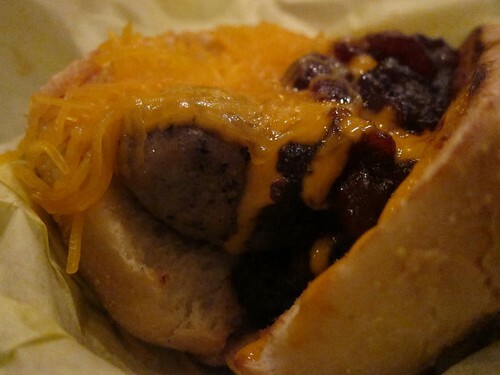 The Jacklelope dog was described as an Antelope and Rabbit sausage with a Huckleberry Compote and spicy aioli. Yum! It tasted even better than it sounded. I hope, though, that no one makes the same mistake I did today and wears a white shirt there. Even though the french roll that housed the sausage was dense and crusty, it could little compete with the compote and I made quite the mess. 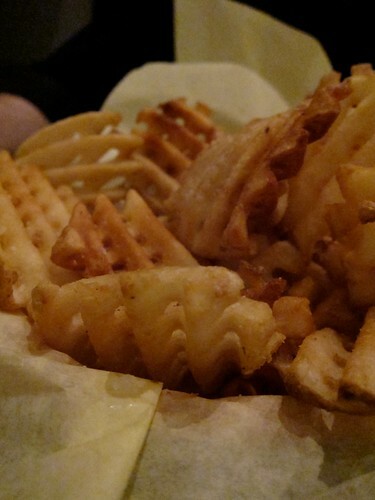 I also ordered a large order of waffle fries. Now, while I can't say that the fries were anything that was outstanding and overly memorable, I do like the option of sauces presented for dipping. On the flip side of the menu was a veritable menagerie of cocktails that all sounded amazing. With an evil grin, we decided that we'd split the Manhattan...in the interest of research, of course. It wasn't just a drink. It was a flavor journey, and quite amazing at that. The Manhattan started off smooth and mellow, but finished strong with as the flavors of the bitters and cherry came through. But, it was the aftertaste that I found to be remarkable as the Bacon infused bourbon really make its presence known. Quite impressive. I only really noticed one really distressing thing about Frank when I talked to the waitress for a bit. The restaurant does not have a kids menu and that shocked me. I mean...REALLY shocked me. It seemed just too easy for a place with hot dogs and fries on the menu to just whip one together, especially with a great potential customer base of kids and their parents with the children's museum just down the street. Anyhow, I'll digress this time on the rest of my kids menu soapbox. While I couldn't find kids menu, I did notice a couple of vegetarian options including a Portabello Cheesesteak, which I think I'll get on my next trip back. That sounds delicious. I found the service to be outstanding and efficient, too. It wasn't long at all before we were walking back to Michelle's office building and enjoying the warm Texas weather as of late. Mariah Update: This is a post Lee wrote back in July of 2009. I've decided to repost for a couple of reasons. First, you fine readers will be pleased to know, that in a few short weeks, he will be marrying Michelle, the woman he is newly dating in the post above. Second, I revisited Frank recently as one of the first dates with my new boyfriend and updated the pictures. We, at Dining in Austin, were a little more ghetto in the picture department back in 2009. I've been to Frank on several occasions over the past few years and I've grown to really appreciate it for what it is, a greasy, late night dining spot. There have been nights where, after having a few drinks, you just want something dripping in fat and deliciousness. Thats why Frank has become one of my go-to late night spots. Now, when I go, I only ever get two things, the Jackalope and Poutine (though Poutine isn't on the late night menu, you have to go before 10 to get it). Lee pretty accurately described the Jackalope above, but I will add that, though its messy, the sweet, savory combination of the antelope sausage and the huckleberry compote really make for delicious late night noshing. I could write novels about the deliciousness of the poutine too. Crispy waffle fries covered in brown gravy with melted cheese curds on top. I know if sounds totally gross. The first time I had it, I thought I was going to hate it, but trust me, its the best thing on the menu. 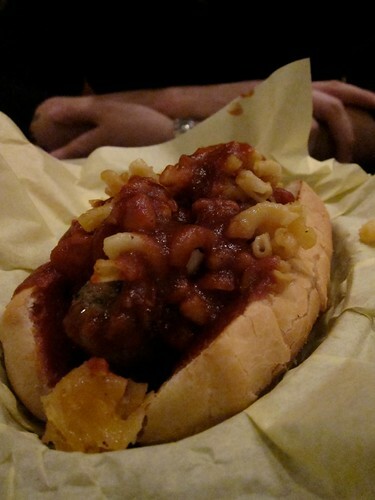 Last time I went, my date ordered the Notorious P.I.G., a pork jalapeno sausage covered in mac and cheese and BBQ sauce. The whole combination was just too overwhelming. First it was hard to get a bite without sauce covered mac and cheese falling all over the table. Second, the mac and cheese didn't really add a texture or flavor component that was very notable. I think its one of those should-be-great-in-theory-so-lets-put-it-on-our-menu-to-wow-people kind of foods. Overall, I like Frank for what it is, late night delicious greasiness.